A very versatile machine allowing you to work directly from the river for prospecting as well as completing the recovery phase. 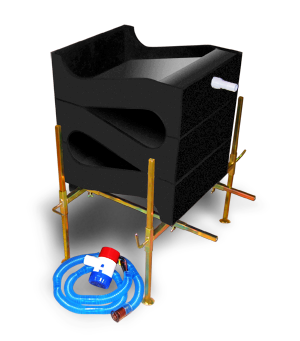 Recirculation allows use in dry areas. All parts fit conveniently into a small container (included) for portability. The variable speed option puts more control in your hands. One of the oldest and best ways to recover fine gold from your prospecting operation. The Blue Bowl is a wonder at separating the finest of gold dust. Don't worry about that black sand - it goes right in the bowl with the rest of the concentrates for easy separation. A favorite for our fine Colorado gold. 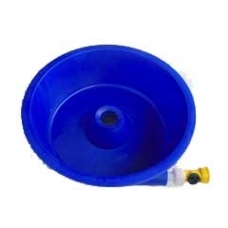 Recirculation system parts available also. Rugged and compact this model is equipped with a slate processing table. Easy set-up and maintenance allows you more time for working those buckets of dirt. And the "Glory Hole" will eliminate the need for snuffer bottles. A must see demonstration in our showroom. With a very large spiral wheel you can handle a great volume of material with ease. The spirals are constructed out of rubber (similar to Miracle Mat) allowing VERY fine gold retention. Use this machine for both concentrating and recovery to minimize equipment needs. Complete with recirculating system and extra hoses for cleanup. Simple, compact concentrator that has become very popular. G-force separation and vortex matting will make your job easier. This is where the Miracle Mat got its start and the magic is in the mat. Use for cleanup of dredge concentrates or classify and feed directly from the river. Cleanup is a snap with removable mat and spray hose.